I spent this past weekend working on what I would call my first real "magnet job." 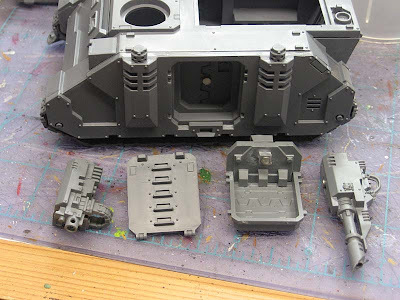 I managed to take the standard Space Marine Rhino chassis and with the correct bits and some magnets, I've made it into a Predator with all the options or a Rhino with all the options. I didn't work out the Razorback part of it, but that wouldn't be too hard if I had the bits for that. I'm using a variety of sizes of Rare Earth magnets. 1. Use the right size. Smaller and lighter bits don't need huge magnets. 2. Make sure your magnets make contact. The faces of your magnets should match perfectly to get the most contact and hold. 4. Use only what you need to. Sometimes it two magnets, sometimes it's magnet and a screw. Look at what your working with and let the model dictate what's best for the situation. This post is Part 1 of 2 and I'm going to cover how I did the side sponsons in this post. Part 2 will cover the turret and it's construction. I decided to break it into two posts since I had so many pics and I wanted to explain the steps involved. 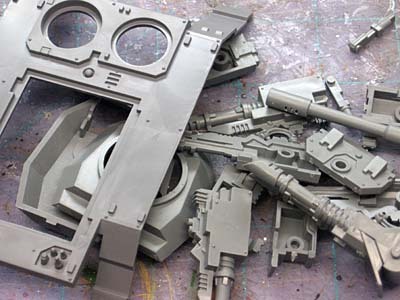 The first thing for me is to get all my bits and clean off the mold lines. I built all the weapons first.I went through the various magnet tutorials out there on the internet. No sense in trying to reinvent the wheel when somebody has probably already figured out a good way to do this. I decided to keep this as simple as possible since I'd never done any serious magnet work before and I didn't want this project taking forever to finish. One of the key things though for me, when it comes to magnets, is that you shouldn't be able to tell the piece is magnetized by looking at it. I like the magnets to be "invisible" and I don't like when a model is modified to accommodate magnets either. 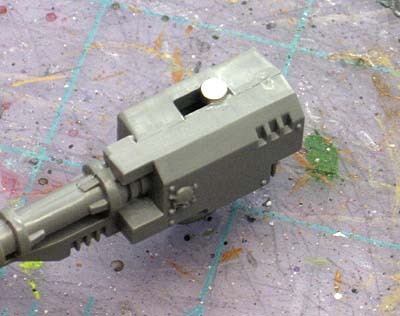 This first bit of conversion work came with the top portion of the sponsons. 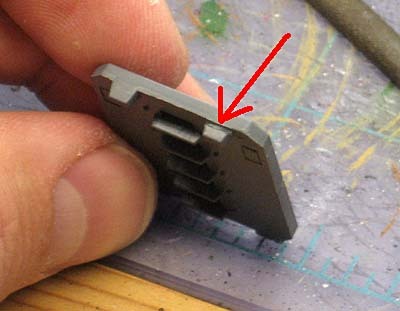 They are assembled normally and then the bottom portion (below the red line) of the weapon mount is cut off. This leaves a square shaped piece on the underside of the sponson. 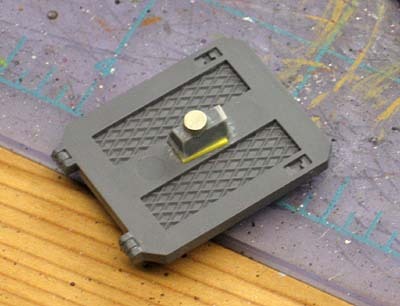 In this square shape, I drill a hole just large enough to accommodate one of the magnets for the weapon mounts. The other magnet will be in the top of the weapon itself. A drop of superglue and push the magnet into the opening to dry. It important to match the correct weapon up with the correct sponson. The magnets will have a slight lean to them no matter how hard you try to get them straight when you glue them in place. You can correct this lean when you put the other magnet into the weapon itself and end up with a balanced looking weapon in the end. Adding the other magnet was easy. I just needed to round out a portion of the opening in the top of the weapon, add a tiny amount of superglue, place the magnet in position and then attach it to the sponson. I used the sponson to push the weapon magnet into place, making minor adjustments as needed so the weapon was level and correct in it's final position. The doors were easy too. At least the Predator ones were, the Rhino doors took some extra work. I happened to have two magnets that filled the exact space between the outer and inner doors. One on each side and I was all set. Since the Rhino door sits flush with the side of the vehicle instead of recessed like the Predator door does, I needed to make up the difference between the magnets. A bit of sprue and a plasticard shim were all it took. Being able to get Predator sponsons off is no problem, there's plenty to grab a hold of. But the Rhino doors are another issue. They've got nothing substantial sticking out from the side to grab a hold of. I solved that one by creating a tiny notch along the top of one of the ramp teeth that you can grab with your fingernail and pull the Rhino door off with no problem. It's small enough that it will only take a bit of "battle damage" painted there to hide the notch. And all of the options set up. 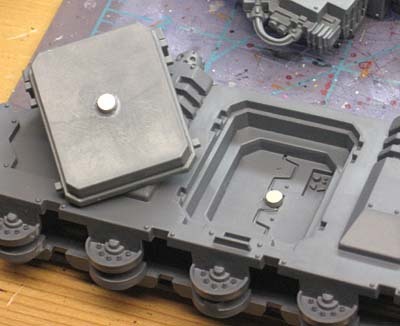 Lascannon or heavy bolters for the Predator or just the regular doors for the Rhino. Part 2, magnetizing the turret. I need to break down and buy a ton of magnets so I can do this sort of stuff. Thanks for the guide ron! This is a great post! 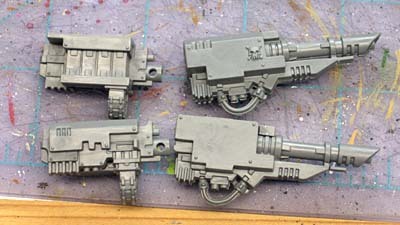 I have the lascannon sponsoons and want to be able to switch them to heavy bolters. I didn't think of magnetizing the top of the weapon; time to break out the saw blades! That's pretty fancy stuff there, Ron. You make it look so easy. I'm kinda dreading having to model a bunch of boring Rhino Tanks for my army (at least 4).....maybe adding magnetic options is the way to make them into fun projects. 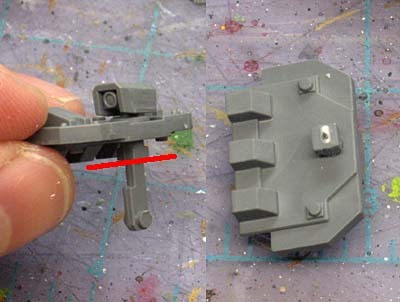 Magnetizing the predator sponsons is probably the smartest thing you can do, simply because where you choose to install the magnet is the weakpoint on the sponsons. When they break, it is right there. As for the razorback,if you don't glue down the top hatch, and paint both sides, you could flip it over for a razorback at need, just not sure how you would magnetize the turret parts to allow weapon swaps. 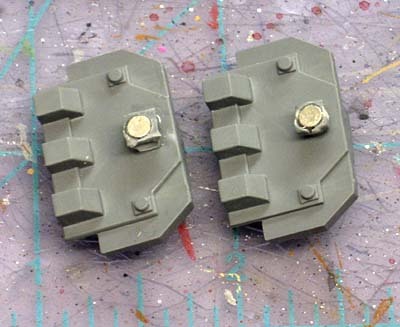 Maybe magnetize the top cover so the guns could be slid off of the pivots. Nice work, very nice work indeed - one quick thought though, have you every thought about using a bit of metal/screw etc instead of one of the magnets. You will lose a bit of power but I've never found that to be a problem with rare earth magnets and you won't have to worry about the polarity of the magnets themselves. It also makes the magnets you have go a bit further. FoxPhoenix135: Once you take the extra time to magnetise, you'll never build another non-magnetised vehicle again. C Trudden: If I can get all my pics uploaded, I'll have the turret portion of the post up later on this week. Tom: Sometimes I use screws but it really depends on what I'm joining. I tend to use them with heavier and bigger objects. Nice guide. I tried to save as many magnets as I could, so for things like rhino doors and top hatches/storm bolters I just glued some lengths of paper clip. I am using larger magnets though so it might not work as well with the size you are using. Here's a link to my post showing all the locations I put magnets - this included 4 along the top of the hull for things like H/K missiles and searchlights, and one in the front for demolisher cannon. I have two Predators on sprues in there boxes untouched in the corner of the room, I think I may have to get them out along with some magnets. That is a much easier way to magnetize my preds... I had originally put tiny magnets in between the two halves of the HBolter and the lascannons to get them to go together and kept the little stem, but it's very fragile. I think I'll be digging those babies out tonight and trying it this way! Thanks! Max: Excellent, maybe this will give you that extra stability then. Hope it works well for you.